John toured extensively in 1975 with Danny Thompson, John Stevens on drums and Paul Kossoff on guitar. 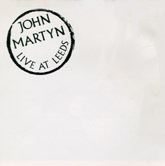 A full-blooded and uncompromising concert at Leeds University was recorded with a view to releasing a live album, but Island weren’t keen so John produced, designed and sold “Live At Leeds” mail-order from his Hastings home. Kossoff had been out of the music scene for some time with self-inflicted health problems before John invited him to play. Apparently his playing was so erratic that it had to be cut from the recording. The album confirmed his reputation as a witty and original stage performer with a wicked line in banter and repartee, and this, coupled with excellent album reviews, was bringing John Martyn the audience that was to stay with him for years to come. Acting as producer and distributor took it’s toll on John and suffering from nervous exhaustion he didn’t play for months after the tour taking a sabbatical for four months in Jamaica whee he was to meet Lee ‘Scratch’ Perry. The recent reissue of Live At Leeds (One World Records, 1998) includes 5 bonus tracks with Paul Kossoff playing guitar – My Baby Girl, You Can Discover, So Much In Love With You, Clutches and Mailman.